There is a lot of room for interpretation in terms of what the experts say your child can or can't do at a certain age. The most important thing is to have them doing some chores right from the beginning. If they are old enough to take it out, they are old enough to put it back. It may not be perfect, but it doesn't matter when they are younger. Resist the urge to go after them and put items where you think they belong and in your order. If blocks belong in a basket and they make it in there, let it be good enough. You can always straighten it a bit when you hit that room in your monthly deep cleaning. Kids do well with routines and knowing what is coming will make it easier. If "pick up time" happens before lunch and before dinner every day, it's easier to get them to pick up. You know your children and their abilities, while they should always be picking up after themselves from a young age, what about household chores. Can they help feed the pets? Can they help dust lower shelves? 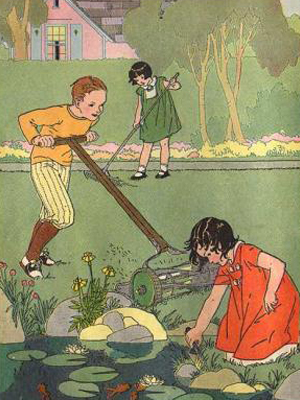 Can they help pull weeds? These are all things that can be done at a very young age, younger than 5... You just have to be willing for it to not be perfect. For instance, if they aren't doing a very good job yet, you can have them help you dust on the weekend, but you go over it again on pick up day. It's more important to teach them how to help, then to have it done perfectly.